*Bridal posy – This design features a mixture of off white blooms in a loose irregular rustic style including an Austin roses, peonies, ranunculi, hydrangea classic roses and buds, Queen Anne’s lace, baby’s breath, silver fern, and native gum foliage. The bouquets handle is partially wrapped in hessian with a pearl sash. Measures approximately 25-34cm (10-13 inches) across when evenly spread (not including the foliage spray). This is an oval posy and measures differently depending on direction. *Bridesmaid posy – A textured loose rustic style that would look amazing in front of any colour. This design features a mixture of off white blooms in a loose irregular rustic style including an Austin rose, classic roses and buds, Queen Anne’s lace, baby’s breath, silver fern, and native gum foliage. The bouquets handle is partially wrapped in hessian with a pearl stud. 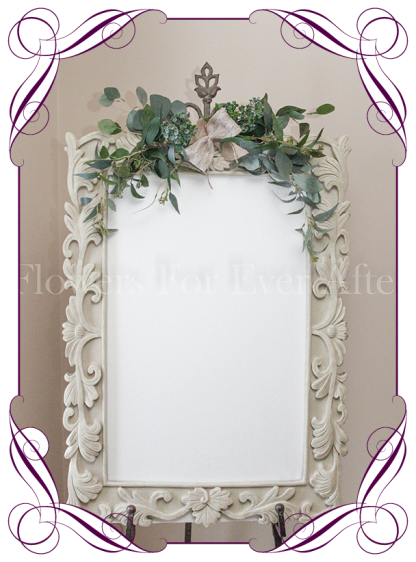 Measures approximately 20-21cm (8 inches) across when evenly spread (not including the foliage spray). A textured loose rustic style that would look amazing in front of any colour. 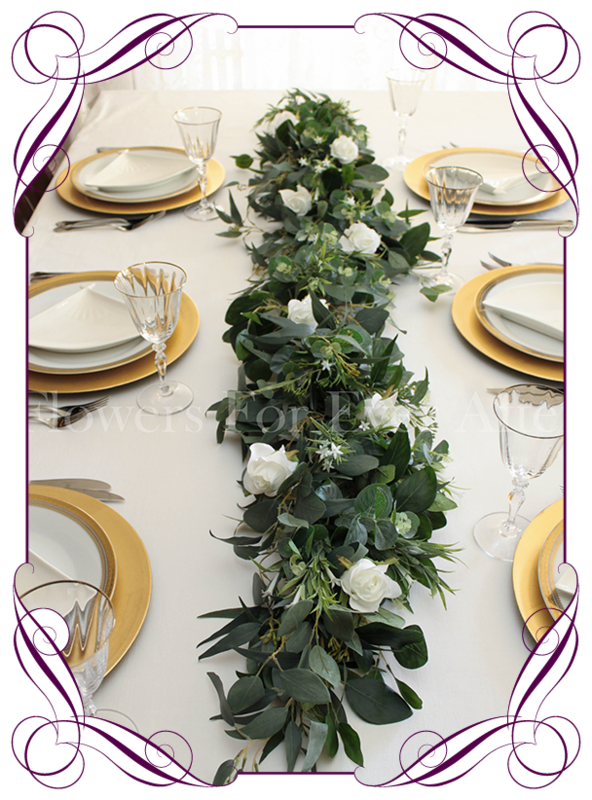 This design features a mixture of off white blooms in a loose irregular rustic style including an Austin roses, peonies, ranunculi, hydrangea classic roses and buds, Queen Anne's lace, baby's breath, silver fern, and native gum foliage. The bouquets handle is partially wrapped in hessian with a pearl sash. 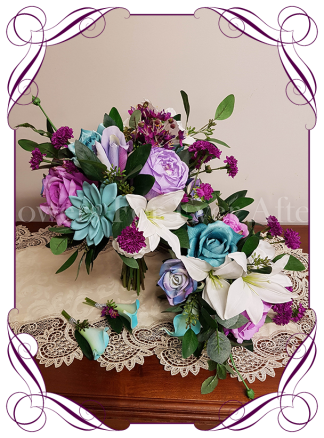 Matching pieces available in this design (in separate listings) include the bridesmaids bouquet, Grooms button, Groomsmen's buttons, and cake flowers. 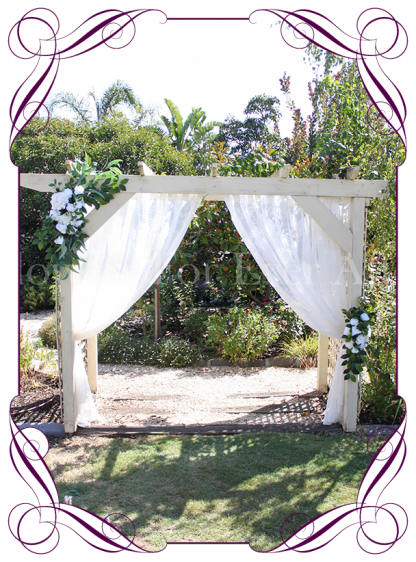 A textured loose rustic style that would look amazing in front of any colour. 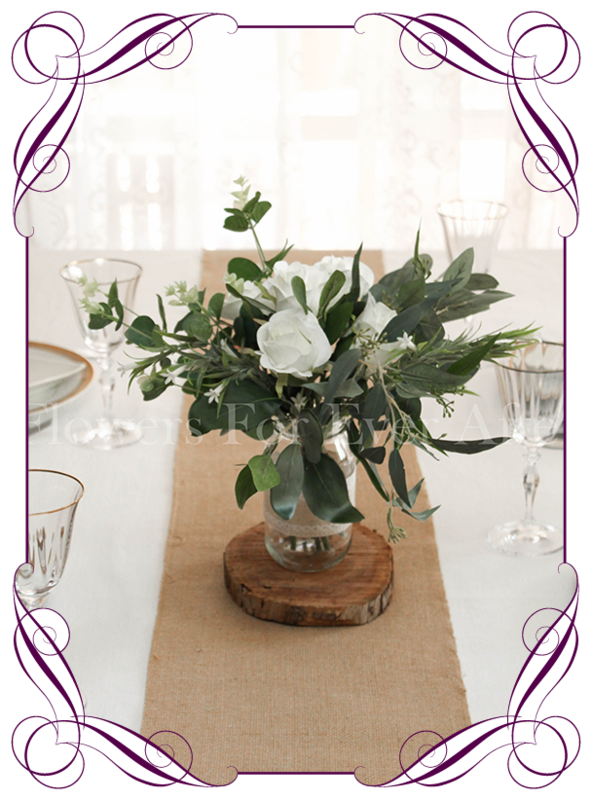 This design features a mixture of off white blooms in a loose irregular rustic style including an Austin rose, classic roses and buds, Queen Anne's lace, baby's breath, silver fern, and native gum foliage. The bouquets handle is partially wrapped in hessian with a pearl stud. Matching pieces available in this design (in separate listings) include the bridal bouquet, Grooms button, Groomsmen's buttons, and cake flowers. 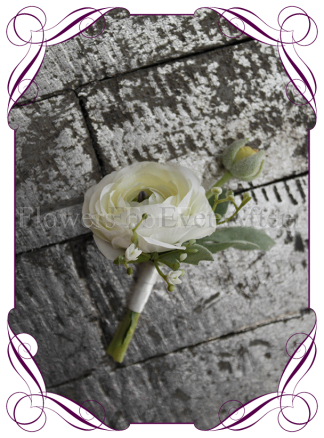 The perfect rustic gents button made to match our Brooke and Georgia bridal bouquet designs. 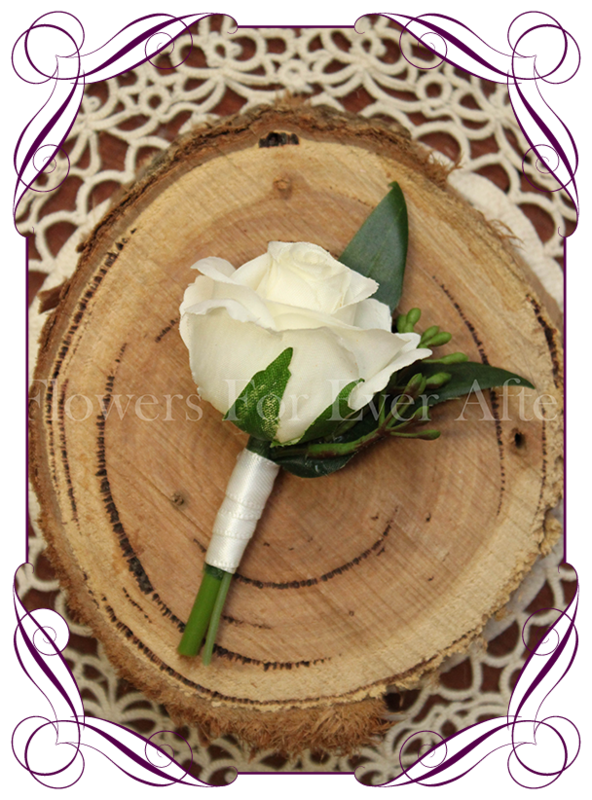 Featuring an ivory white rose bud with seeded gum and foliage accents. The stem is partially wrapped in ribbon. 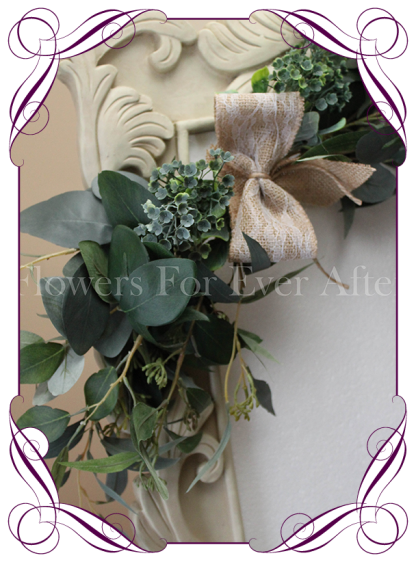 A simple style in a more unusual bloom. 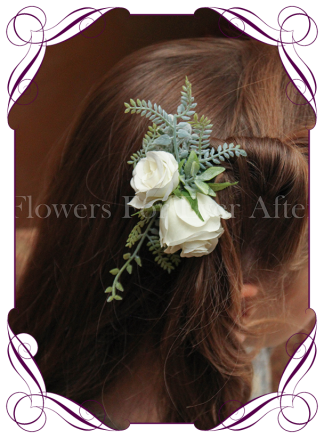 Features a ranunculi and bud, baby's breath and foliage with off white satin on the stem Corsage pin included. 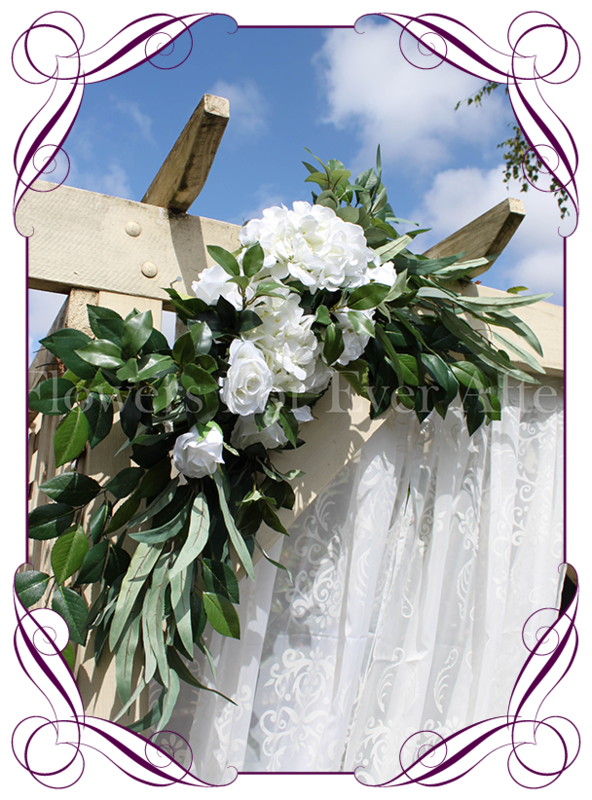 A beautiful silk wrist corsage to match our Brooke package, or suitable for any neutral toned package or as a formal occasion corsage. 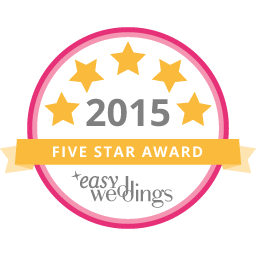 Features ranunculus, baby's breath and foliage with off white satin edged organza ribbon work. Can be set on a diamante or pearl bracelet...both options are available in the drop menu below. 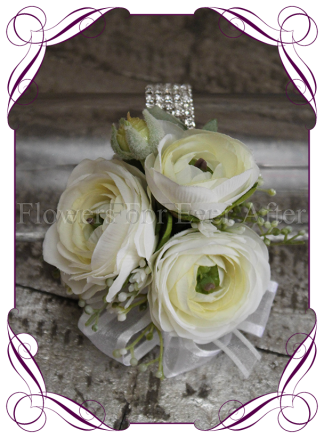 Corsage Setting * Choose an option"Wrist Corsage set onto a Diamante bracelet""Wrist Corsage set onto a Pearl bracelet"
contains a beautiful dense assortment in flowers including, white roses, peonies, lisianthus, seven sons, sea holly thistle, baby's breath, and some lightly scattered diamante crystals for a touch of sparkle. This arrangement is made on a flat cork base so that it only needs to be sat onto the surface of the cake (no holes needed). Measures 8 inches across and 4.5 inches deep. 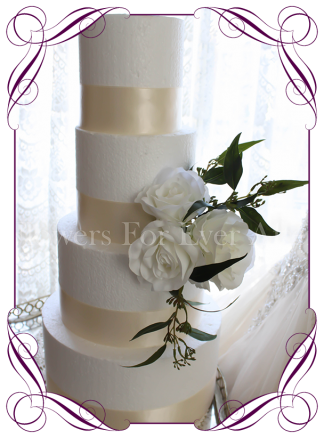 ***Note: The cake tiers in the image are all 5 inches high. They measure 8 and 10 inches across respectively. The last photo in the Gallery is of the down sitting on the 10 inch tier to show how it would work on a single larger cake. 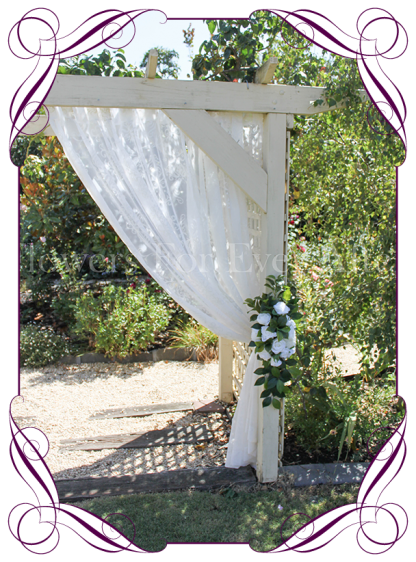 A beautiful silk wedding arbor / arch decoration perfect for an arbor, the center of an arch or on a table. 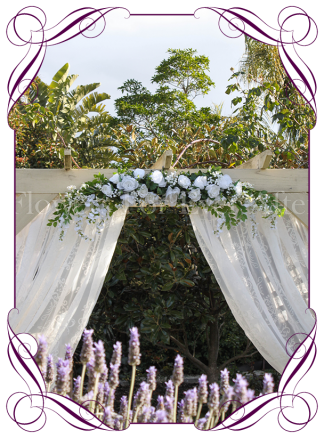 Features white roses, peonies and baby's breath with foliage and hanging white wisteria. 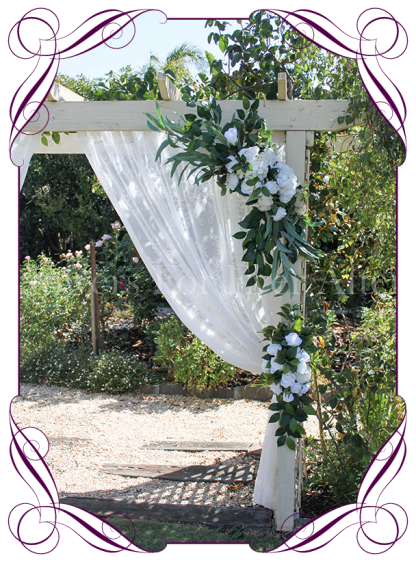 This arrangement can be removed from your arbor/arch and placed in front of the bridal table as a table garland on the day also...a great way to minimize costs when decorating. Measures approximately 110cm in length and 20-22cm wide at widest point. 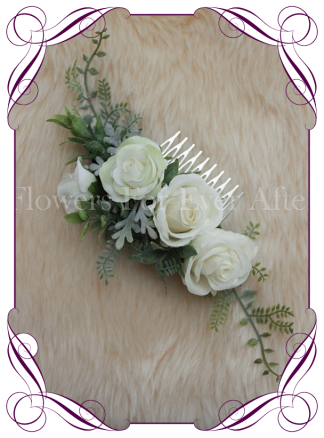 Features off white rose buds with a spray silver fern foliage. Set onto a small metal comb. 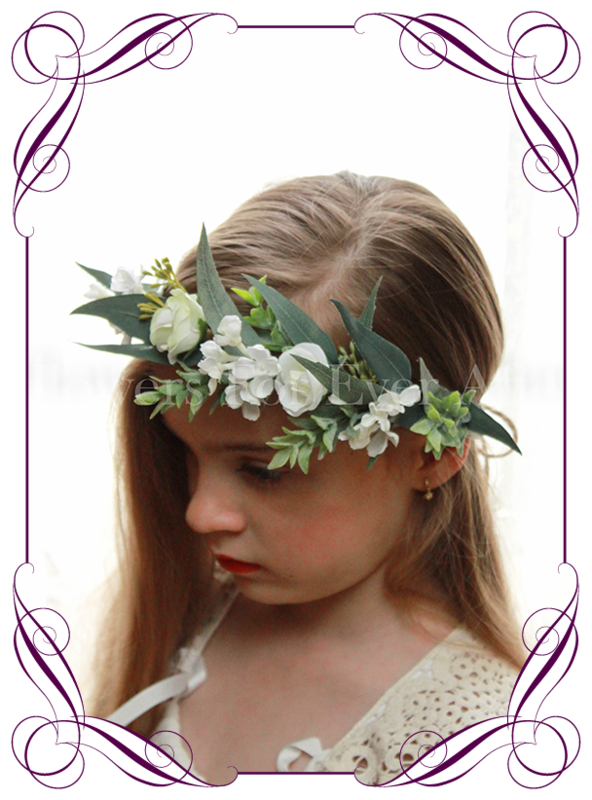 Floral design measures 10cm x 5cm (4 x 2 inches). 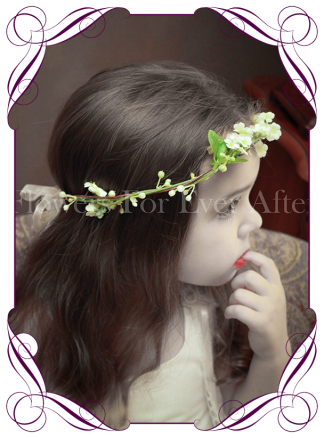 Suitable for both adults and children. 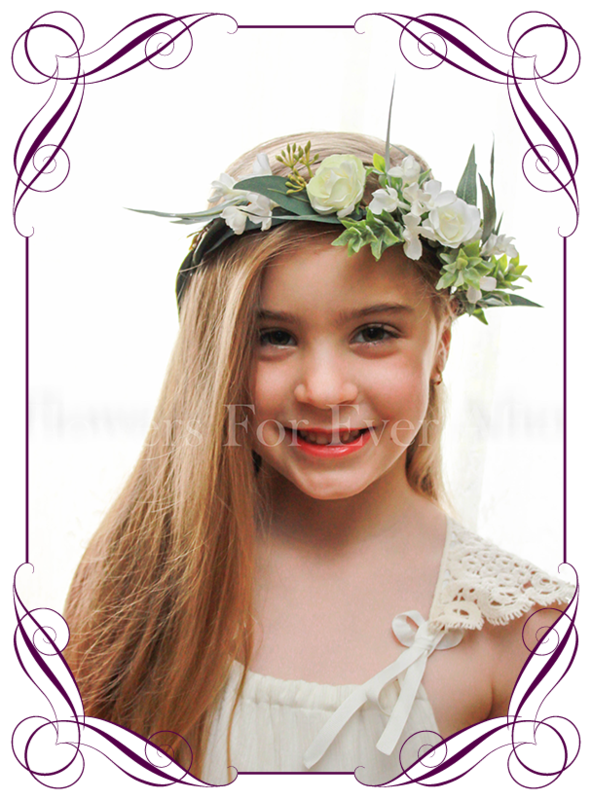 Matching bridal posy, bridesmaids posy, flower girl posy, floral belt, buttons, and package are available in separate listings. Features off white rose buds with dusty miller and silver fern foliage. Set onto a metal comb. Measures 22cm x 6cm (8.5 x 2 inches) from fern tip to tip. 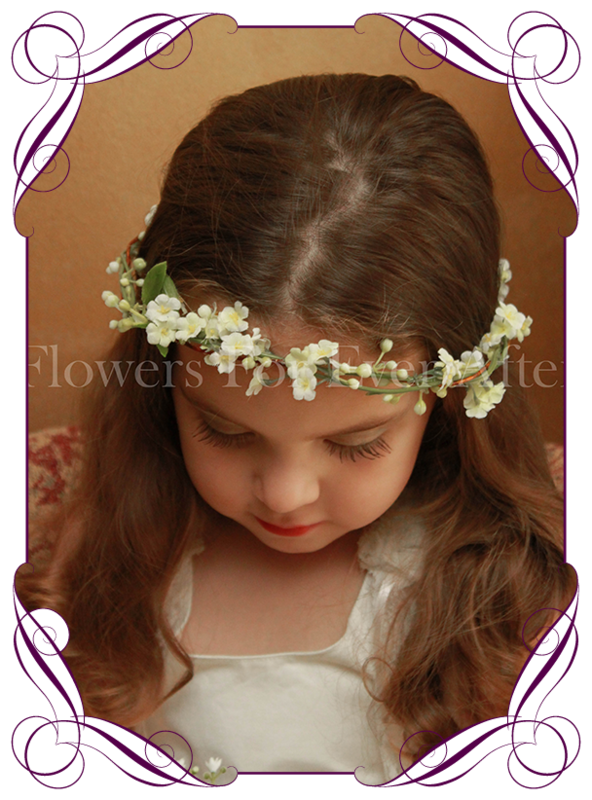 The roses section itself is 10cm long. 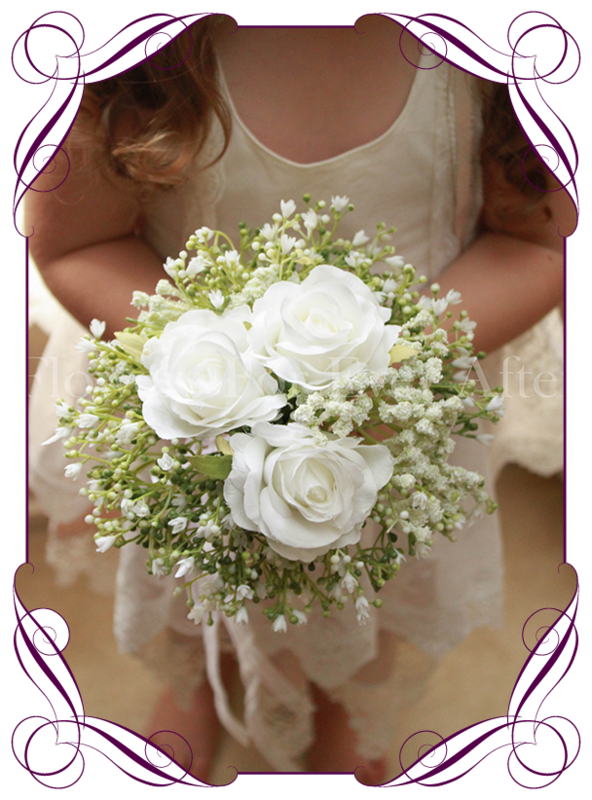 A simple small arrangement, perfect for children. Features a half size rose bud with gum seed on native foliage. Stem partially wrapped in your choice of finish. Stem is cut shorter (compared to adult sizes) to better suit a child. 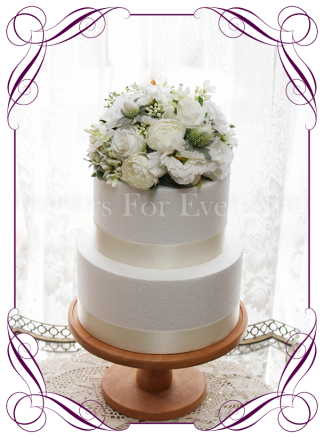 An elegant cake decoration suitable for any wedding flower theme. 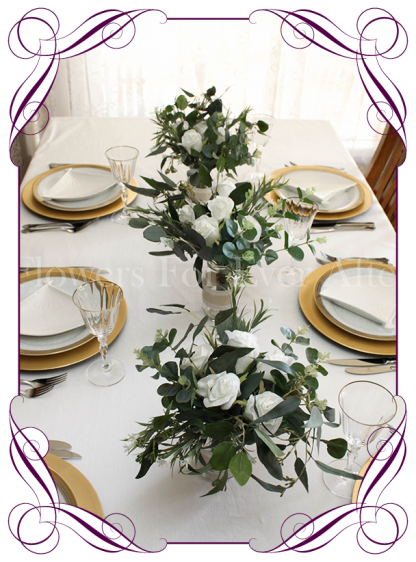 Features an off white open rose, an off white rose bud, baby's breath, and seeded gum leaves. 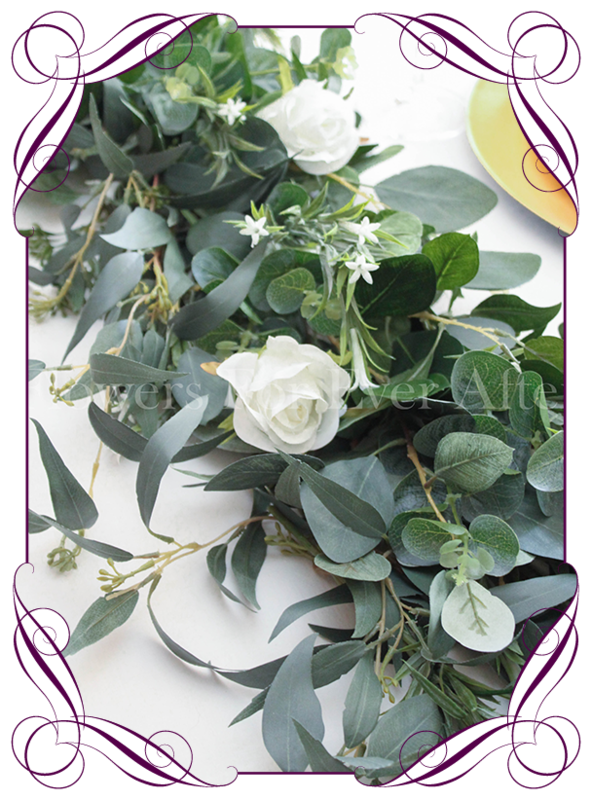 Measures approximately 22cm in length from tip to tip and approximately 9cm wide including the leaves. 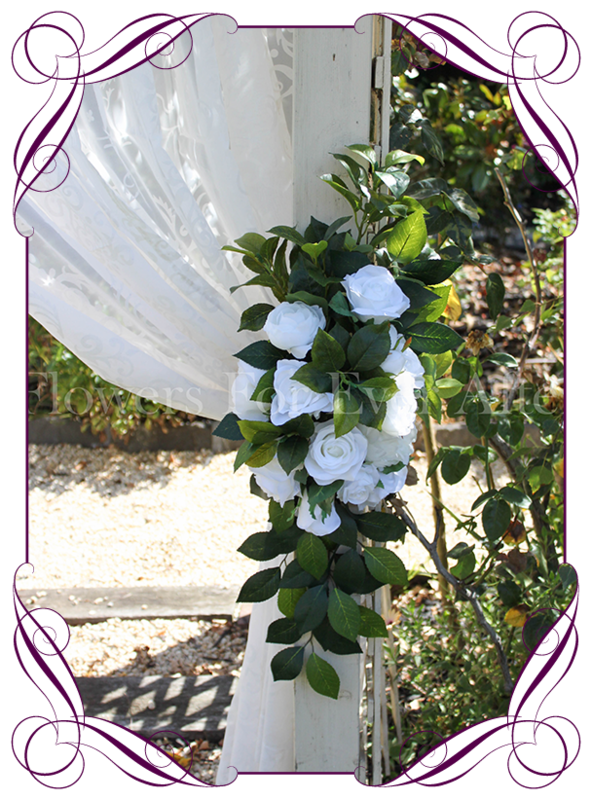 The main open rose measures 8cm across. Note: The cake tiers in the image are all 5 inches high. They measure 5 , 6 , and 8 inches across respectively. 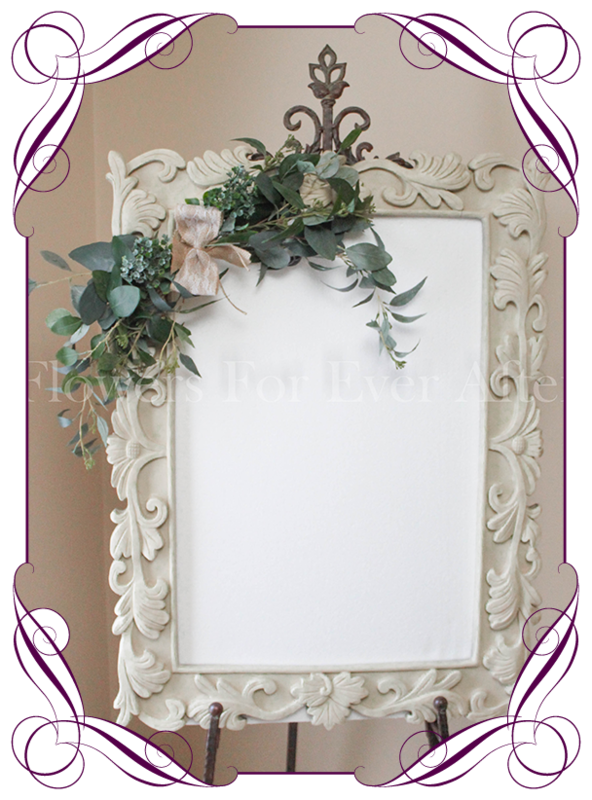 Some of the gallery images show this piece when combined with our small rose matching piece from a separate listing. This listing and price is for the open piece in the first image.